Jimi Hendrix (born Johnny Allen Hendrix; November 27, 1942 – September 18, 1970). He was an American rock guitarist, singer, and songwriter. 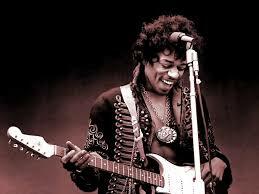 Born on this day in 1942, Jimi Hendrix sadly passed away on the 18th of September 1970. Although his mainstream career spanned only four years. Also, he is widely regarded as one of the most influential electric guitarists in the history of popular music. And one of the most celebrated musicians of the 20th century. The Rock and Roll Hall of Fame describes him as “arguably the greatest instrumentalist in the history of rock music”. Did you know> His first real instrument was a one-stringed “ukelele” that he found while clearing trash from a woman’s home? In 1957, while helping his father, Hendrix found aUkelele among the garbage that they were removing from an older woman’s home. She told him that he could keep the instrument, which had only one string. Learning by ear, he played single notes, following along to Elvis Presley’s “Hound Dog”. On September 18, 1970, the American musician Jimi Hendrix died in London, aged 27 years. For some days Hendrix had been in poor health, due in part to fatigue caused by overworking, a chronic lack of sleep, and an illness assumed to be influenza-related. We remember him on his birthday today. The greatest guitarist that ever lived.